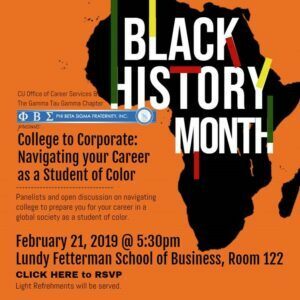 Career Services has partnered with the Gamma Tau chapter of Phi Beta Sigma to present a Black History Month event: College to Corporate: Navigating your Career as a Student of Color, featuring panelists and open discussion on navigating your career in a global society as a student of color. This event will take place on February 21, 2019 at 5:30pm in the Lundy-Fetterman School of Business Room 122. All are welcome and RSVPs are encouraged.